Marnee started off her career as a project manager, but after getting involved in her husband’s business, she recognized that representatives in the manufacturing industry can, and need to help smaller businesses grow within New England. “I feel engineering, manufacturing, and technology to be completely stimulating and just exactly where I want to be. 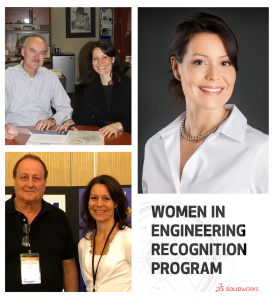 The funniest thing is I never saw myself here.” Meet our March 2016 Women in Engineering recipient, Marnee Palladino, founder and CEO of MARN Inc! What is MARN Inc and what made you want to start your company? “My company is a manufacturer’s agency, so what we do is we represent manufacturers and bring them sales and customers and relationships in New England. The manufacturers can be anywhere in the United States, even outside. Mostly, I represent United States manufacturers.” MARN Inc covers the whole New England territory; they start by strengthening the company’s existing customer base, and then grow it by adding new customers. Since most of the companies MARN Inc works with are typically small and don’t have a large sales force, the best way for them to market is with an outside representative like MARN Inc.
Marnee got the idea to start her manufacturer’s agency while working with her husband’s company, Palladin Precision Products. She lived and breathed manufacturing for the last sixteen of the years they have been married. During that time, she got involved in inside sales: “when I was visiting with the customers and prospects of Palladin, I realized that it would be more valuable – I would have more to offer, if I had multiple manufacturing lines.” When Marnee started MARN Inc, Palladin, of course, was her first client and it grew from there. How did you get your start in the manufacturing industry? Marnee originally had no plans to enter the manufacturing industry; it wasn’t until she started working with her husband that she realized she wanted to continue in it. She went to school for facilities planning and management at Cornell University, which is a far cry from manufacturing and engineering. She decided to combine her experience from her project management business and working with Palladin’s customers to create MARN Inc.
What do you do for fun? Marnee has two daughters, so much of her spare time is spent with them and her husband. She is also an avid golfer and loves to spend time outdoors. Any pets? Marnee and her family have a few chickens! Interested in learning more about MARN Inc? You can view their website here. I'm a Social Media Specialist for SOLIDWORKS and a recent graduate of the University of Massachusetts. I'm an animal lover, fashion enthusiast, and avid concertgoer.